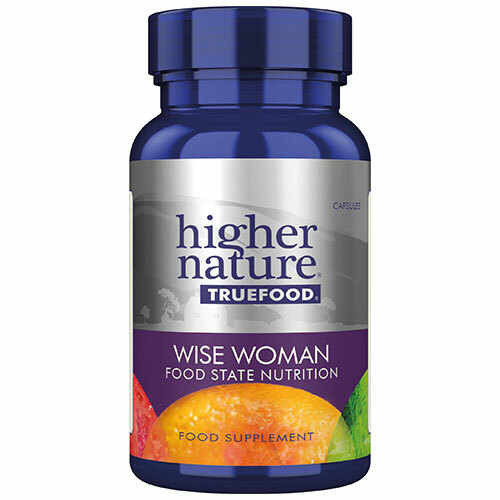 True Food Wise Woman provides vitamins and essential minerals, antioxidant factors, brain foods and amino acids plus a wide spectrum of botanicals selected for women, and a hardy probiotic for digestive well being. Ordinary supplements use isolated vitamins, not the complexed forms found in food that the body expects to eat. As a major advance True Food bio-transformed vitamins and minerals are fermented in a special culture, which complexes them organically, just as they would be in any true food. Independent studies show that True Food bio-transformed nutrients are more effective than isolated nutrients, so much lower intakes of True Food bio-transformed nutrients are needed than with regular supplements. Because of the way the True Food products are made and absorbed in the body they do not have to be attached to a carrier. The body sees the True Food products as food which means there are many more opportunities (ie receptor sites) for absorption in the digestive tract than there are for regular supplements. True Food nutrients also contain B vitamins, betaglucans, glutathione, choline, inositol, amino acids and other phytonutrients naturally found in fermented food cultures of Saccaharomyces cerevisiae (food yeast). Proprietary mixture: magnesium chloride, ascorbic acid, ferrous fumarate, boric acid, zinc sulphate, niacinamide, d-alpha tocopherol (wheat), copper sulphate, riboflavin, pyridoxine HCl, soya, calcium pantothenate, folic acid, sodium molybdate, chromium acetate, thiamine HCl, biotin, manganese chloride, phytonadione, cyanocobalamin, vitamin D2 with enzyme digested S.cerevisiae (soya); selenium, beta carotene, co-enzyme Q10 enriched, enzyme digested S.cerevisiae; natural Lithothamnion calcarea, vegetarian capsule: hypromellose; natural kelp, magnesium ascorbate, bulking agent: microcrystalline cellulose; silicon dioxide, flow agent: magnesium stearate*; parsley, carnitine, sage, hops, vitamin A acetate* (stabilizer: gum Arabic; stabilizer: sucrose; anti-caking agent: maize starch; antioxidant: dl-alpha tocopherol; anticaking agent: tricalcium phosphate); garlic, broccoli extract, artichoke, dandelion root, angelica, cranberry, ginger, natural horsetail, a-lipoic acid, Lactobacillus sporogenes, capsicum fruit (carrier: potato maltodextrin). Adults: Take 3 capsules a day, with or between meals, or as your health professional advises. Contains Vitamin A. Do not take if pregnant or planning pregnancy. May not be suitable for people with a fish or crustacean allergy due to the Kelp. Because of the way the True Food products are made and absorbed in the body they do not have to be attached to a carrier. The body sees the True Food products as food which means there are many more opportunities (i.e. receptor sites) for absorption in the digestive tract than there are for regular supplements. The True Food supplements are fermented in a special yeast culture, however, once the fermentation process is complete the long chain proteins in the yeast culture are broken down and it is these that commonly cause problems such as allergies. Therefore the True Food Supplements can be tolerated by most people. Each product in the True Food range goes through a unique fermentation process. This can result in them having a strong fermented smell. However, pleased be assured, this is perfectly normal and indicates the product will have optimum absorption. Below are reviews of True Food Wise Woman - 180 Vegicaps by bodykind customers. If you have tried this product we'd love to hear what you think so please leave a review. 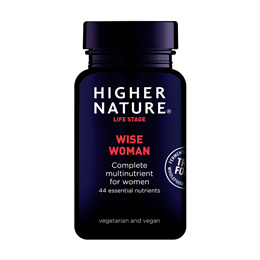 Question about True Food Wise Woman - 180 Vegicaps Are the True Food supplements suitable for those with an intolerance to yeast? a special yeast culture, however once the fermentation process is complete the long chain proteins in the yeast culture are broken down and it is these that commonly cause problems such as allergies. Therefore the True Food Supplements can be tolerated by most people. Question about True Food Wise Woman - 180 Vegicaps Are the nutrients in the True Food range synthetic? The True Food range are all based on a yeast culture and fed soy products to enhance growth and production of the nutrients. These are then extracted and used in the True Food range. They are non-synthetic, natural forms of the vitamins and minerals.